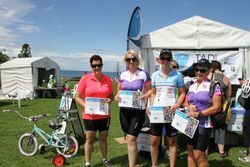 With a gorgeous day and beautiful beach backdrop, women of all ages and cycling skill came together to celebrate International Women&apos;s Day on their bikes with a brilliant turn out for Gear up Girl 2014. Ambassadors Cycling NSW Board Member, Jacqui Brogue, Mrs Margie Abbott and Sydney Councillor, Christine Forster were in attendance and were joined by Alex Unwin, Bicycle NSW CEO, Melanie Gibbons MP and TAD President Monica Vardabasso, speaking about Freedom Wheels modified bikes, the opportunities to women in cycling and about what an important initiative events like Gear Up Girl are to promote a better environment for cycling. Thank you to our fantastic TAD Heroes for raising over $4,067.20 for Freedom Wheels bikes so that kids with disabilities can also enjoy being on a bike. 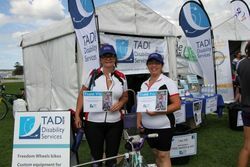 It was lovely to meet some of you at the TAD Disability Services stand! 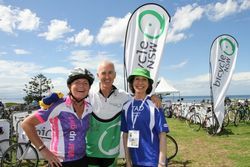 Thank you to Bicycle NSW for choosing TAD as the charity partner for this brilliant event. See the photo album from the day here.